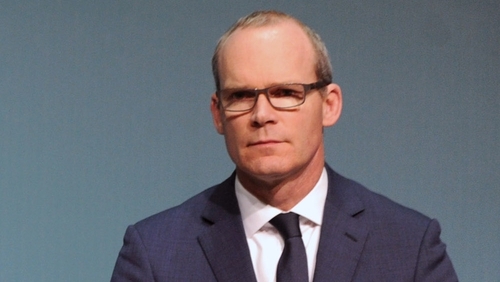 Tánaiste and Minister for Foreign Affairs Simon Coveney has said the EU needs to see an approach coming from the British government that allows for free flowing trade on the island of Ireland. Speaking on RTÉ’s News At One, Mr Coveney said that the EU is trying to protect the status quo on the island of Ireland and will work with the British government. The EU’s draft legal text on Brexit has proposed that the territory of Northern Ireland shall be "considered part of the customs territory of the EU" in the event of the alignment option contained in last December’s political agreement coming into effect. The legal text spells out in detail the way in which Northern Ireland would remain within the customs union and single market, if other solutions are not found. As reported last night by RTÉ News, the text speaks of a "common regulatory area" on the island of Ireland governing customs, VAT, energy, the environment and agriculture. The text says that the European Court of Justice would continue to have jurisdiction over Northern Ireland where EU rules apply. Northern Ireland would also have to abide by EU state aid rules if the default alignment solution - or Option C - takes effect. There would be joint EU-UK customs checks on goods coming into this new regulatory space. Addressing a news conference in Brussels, the EU’s chief negotiator Michel Barnier said the draft text faithfully reflected the commitments made by the EU and UK in December. He said: "The backstop [Option C] is the only way to guarantee that the joint commitments will be upheld in all circumstances." Mr Coveney said today's text provides reassurance on a "fallback position" in the absence of an Option A from the British government. He said: "Nobody's looking to pick a fight here, or have a go at the British government, or their position. "We need to have some certainty, and what the EU has done here is put a draft withdrawal treaty in place, and, of course, that leaves open the option of a new approach." He said the EU want to support the British government on an Option A, but, he said, it is hard to see that being done if the British government continues to pursue the insistence of leaving the customs union and single market. Meanwhile, Mr Barnier said he will meet Sinn Féin’s Michelle O’Neill and the DUP’s Arlene Foster in Brussels early next week. He added: "Daily life around the border should continue as today. Already today NI has rules in place that are different from the UK." Mr Barnier was asked repeatedly if the draft text interfered with the constitutional order of the UK. He replied: "I know the consitutional order of the UK and we all have to respect that, and in respecting that order... we're trying in practical, pragmatic terms within the law, we're trying to find solutions [to the Irish border issue]. "This backstop will not call into question the constitutional order of the UK. We will respect that," he added. When asked if the effect of the text would mean a border along the Irish Sea, Mr Barnier said that there could be "technological solutions", as envisaged in Option B, in "ports and aiports". But he would not regard this as a border. Mr Barnier said he was prepared to discuss the UK's preferred options of A and B. "We are waiting," he said. But, he said, the EU's responsibility was to citizens North and South, the Good Friday Agreement, and at the time of the signing of the Withdrawal Agreement [in October] "we need an operational solution." Mr Barnier denied he was attempting to provoke the UK. "Brexit was a unlilateral decision", he said, "and we were now just 13 months away from the departure date". Mr Barnier has also called on London to "pick up the pace" of talks if it wants a deal this year. "If we wish to make a success of these negotiations ... we must pick up the pace," he said. The Taoiseach has said it is up to Britain to bring proposals to the table if it does not wish to trigger a backstop agreement that would fully align Northern Ireland with the rules of the EU to avoid a hard border. "Now it is up to the UK to bring proposals to the table to make that possible," Leo Varadkar told Newstalk, adding the draft Brexit withdrawal treaty will put into legal effect the backstop arrangement or "Option C" agreed by negotiators in December. He said: "It's not okay for people, whether pro-Brexit politicians in Britain, people or parties in Northern Ireland, to just say no now. The Taoiseach added: "It's incumbent on them if they can't accept the backstop, well then they must detail how Option A or B would work." He said: "One mistake we shouldn't make is a mistake that a lot of people seem to be making, that one of the political parties, the DUP - as important as it is and as big as it is - speaks for everyone in Northern Ireland." He said the business community in particular did not want any new borders. It comes as British Foreign Secretary Boris Johnson has claimed the issue of the border is being used to try to keep Britain in a customs union with the European Union and frustrate Brexit. "The issue of the Northern Ireland border is being used quite a lot politically to try to keep the UK in the customs union and effectively the single market, so we can't really leave the EU," Mr Johnson told Sky News, adding there were options to allow Britain to leave the customs union without having a hard Northern Irish border. Responding to yesterday's reports of the draft legal text, DUP deputy leader Nigel Dodds said the reported details regarding the proposals for a hard border are a "ludicrous" suggestion that will not go anywhere. "This is a ludicrous over-the-top suggestion put forward by Michel Barnier. It will not go anywhere. "The way forward is to get into the trade talks and then and only then will you know what the border arrangements need to be," he told BBC Radio Ulster. Boris Johnson yesterday suggested that the British government should focus on preventing the border becoming "significantly" harder, reigniting a row over the issue. Mr Johnson added: "What the letter says is that, actually, there are very good solutions that you could put in place that would obviate, prevent any kind of hard border but would allow goods... to move freely without hindrance whilst allowing the UK to come out of the customs union, take back control of our tariffs schedules, take back control of our commercial policy, take back control of our regulation. It is a very positive letter." Downing Street insisted that the government is focused on "no hard border". Mr Johnson said that "even if a hard border is reintroduced" on the island of Ireland, the vast majority of goods would not be checked.